Will we see a Grayling effect? Yesterday, the ONS (Office for National Statistics) released the SPPI* figures for Q1 2019. The graph below shows the SPPI for All Services at Gross Sector level (dark blue) and the indices for Freight Transport by Road (bright pink), Sea Freight services (dark green) and Ferries for Commercial Vehicles (light green) for the past 5 years. The graph doesn't show the highest riser in the Transport & Storage grouping over the past five years - that honour goes yet again to Business Airfares. But it shows both the second highest riser, Sea Freight, and the lowest riser, Commercial Vehicle Ferries - this last scarcely managing to get exceed its position five years ago. The dip in ferry prices in 2016 was ahead of any of us having an inkling that Brexit would be more than a passing phase, but it will be interesting in July, when the next set of SPPI figures is out, to see whether there has been any Grayling effect! *The Service Producers Price Index is a bit like the CPI - it shows the increase in prices and rates paid, but for services provided by businesses to other businesses and government. It provides a measure of inflation for the UK service sector with individual price indices, such as Freight Transport by Road, aggregated to create an all-services industry index. The deadline for submissions for the latest UK government gender pay gap exercise passed at midnight last night and 10,444 companies and organisations have so far submitted, compared with 10,562 for last year – so most companies have complied, although the overlap between the two years is only 9,359 organisations. This piece is specifically about logistics and transport – see the mainstream press if you want to understand the issues at a national level. 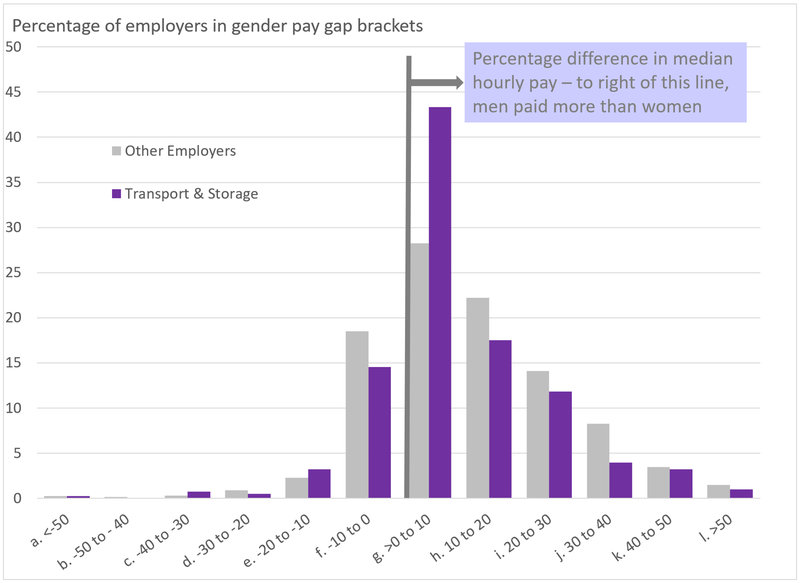 In line with the general picture, and looking at all the data, the pay gap in the transport and storage sector has widened, with 79.8% of companies paying men more on both of the main measures. If you think logistics and passenger transport don’t have a problem, though, think again. If you look at companies which have submitted for both years, so you’re comparing like with like, and again looking at the median of all the data points, whereas other types of company and organisation have over 39% of women in the top quartile, for logistics companies that figure is just over 14% and for passenger transport it has actually reduced to just over 9%, when women make up just over half of the population. You can find descriptions of how the pay gap is calculated and some of the causes of the gap in a presentation I gave to the Women In Logistics Forum Committee last year and I’ll be presenting on this topic at this year’s CILT International Centenary Convention on the final day. Last week the ONS (Office for National Statistics) published its latest figures for job vacancies across the UK, and I was freshly struck at what a changeable business we are. 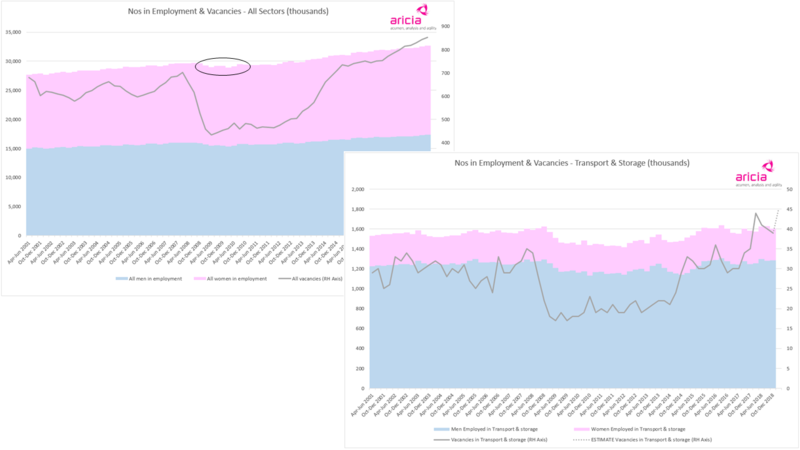 What these two graphs show is employment of men (blue) and women (pink) – the top graph is all sectors and the lower one Transport & Storage, with numbers in employment measured against the left hand axis. On the right hand axis is the volume of vacancies, which is shown by the grey line. The overall picture is that our industry is very erratic when compared with the country as a whole, and with our peaks of employment and vacancies rarely coinciding with what we all tend to regard as “peak”. The final vacancy plot on the Transport & Storage graph is my own estimate of what the vacancy figure will be for Jan-Mar based on the two previous rolling quarters …continued below graph. I’ve written before about the drop in employment in our industry when the most recent recession hit, compared with just a wobble in the plateau of total employment (the bit I’ve highlighted with an oval). Although we only represented 5.5% of the total number of employed, we represented more than a quarter of the lost jobs that dip illustrates. We were very good as an industry at cutting costs, but not so good at looking to the future. Now I need to say that the periods are different for the two measures with the total in employment reported by conventional quarters that are not seasonally adjusted, whereas vacancies are reported by rolling quarter and are seasonally adjusted – I have selected the rolling quarter that matches the conventional quarter. All sets of figures are in thousands and I’ve made the relative scales proportionate, so that although you have to have a different scale because of the different numbers, the volume of vacancies when compared with the numbers in employment is the same for both the total and Transport & Storage. And of course the other thing that strikes you is the relatively small proportion of women employed in our industry compared with the country as a whole - an area where our industry demonstrates little in the way of change. Bit of a different update - a personal story: I'm going to talk about cooking the books. What do the Tesco accounting scandal and M&S 1Bn profit have in common with my first proper role in logistics? Pressure to improve the figures. Towards the end of last month, Carl Rogberg was cleared of master-minding fraud. He was cleared along with the two other Tesco directors, but the fact remains that, in what has been described as a culture of pressure back in 2014, payments from suppliers were being manipulated to make the finances look healthier than they were. I was interested that, in all the reporting, little mention was made of similar situations in other companies. Because I worked for the company, my own mind immediately jumped to M&S in the latter half of the 1990s. Towards the end of Rick Greenbury's CEOship, when great pressure was put on all departments, and in turn on suppliers including our logistics contractors, necessary expenditure and investment was delayed and supplier profit margins were cut, as we all understood that every spare £ was going to be needed. And then the headlines: M&S made over a billion profit that year. Now, you can put the squeeze on operations, but only until the pips squeak. When you try to squeeze year after year (at the risk of too many metaphors), you find that the well has run dry. The Wikipedia entry includes the phrase "profit margins were pushed to untenable levels". This non-strategy catches up with you and, yes, the inevitable happened – M&S profit was down dramatically. So what do these national stories have in common with my first logistics role? I had been a graduate management trainee with NFC (National Freight Corporation – now part of DP DHL), and as part of that training had learned all about how NFC managed its finances, with every contract running its own P&L. My first role after training was as deputy manager of a DC. The manager was leaving the company and the existing deputy manager was being promoted, but rather than taking on the same activities as the previous senior manager, our roles were in some respects reversed because of my understanding of the company’s administration. So I was responsible for the finances. The first time it fell to me to do the monthly provisions /accruals, the area general manager, who was based elsewhere, checked my confidence levels. I said I was pretty confident I knew what I was doing, but I was going to take it all home and work on it quietly over the weekend. I couldn’t wait for Monday to come round! It had gone really badly. The contract had been gently profitable up to now, but my weekend exercise had ended up showing a loss. So I drove over to see the area manager and we pored over my figures. They were right. The contract was making a loss. There was a big fuss and hoo-hah, and one of the directors became involved: had someone been fraudulent? Well, not for themselves I was able to reply - no-one had actually walked out the door with any cash. This was down to genuine invoice payments being spread over too long a period. So a bit of a shock, and it left the issue of lack of profitability, but all out in the open and all apparently understood …until the following week. In NFC we had to submit what were called ‘Quicks’ every week – a quick version of the P&L for that week. No PCs in those days – you rang your quicks through to your area manager, and they were consolidated for the area and rung through to head office. I reported a small loss that was commensurate with what had been shown by my previous exercise. The area manager immediately said that was no good and told me what figure he needed me to report (a profit). I wouldn’t. But at that point I could immediately understand why the finances had got into a mess and why the previous manager had left. He’d given in to being bullied and couldn't see a way out. Now, returning to my reply to the director, I realised that because we were all bonused on the profit that was made, my answer had the potential to be not entirely correct, because if anyone had been paid bonus on those adjusted accounts, that would have been fraud. Money would have gone out the door. My takeaway from this story is that you need to be extremely careful not to exert undue pressure on those below you. Some people prefer an easy life, and although you may not ever have intended them to be influenced to the extent of doing wrong, that can be the result. And you need to be extremely careful about how people, including (particularly?) those at senior levels are incentivised. Could Brexit break the deadlock? Part way through last week, the ONS (Office for National Statistics) released the SPPI* figures for Q4 2018. 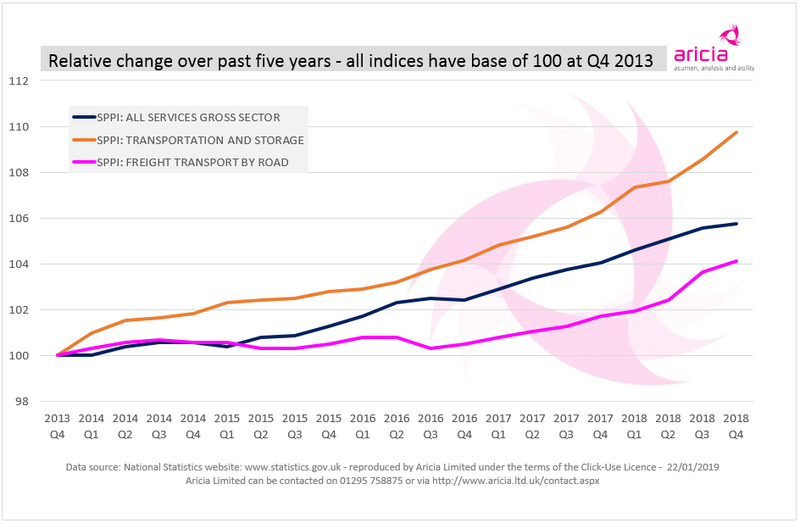 The graph below shows the SPPI for All Services at Gross Sector level (dark blue), the overall index for Transport & Storage (orange) and the index for Freight Transport by Road (bright pink) for the past 5 years. You can see that the overall index for Transport & Storage (which currently contributes just under one fifth to the All Services index , spans all modes and will include passenger related activities as well as logistics) has risen faster than inflation for businesses generally and indeed is credited with being the largest contributor to business inflation generally over the past year. Whereas Freight Transport by Road, has risen by only just over 4% over the past five years in total - the lowest of all elements in Transport & Storage. This low rise has been caused by all sorts of factors, but includes the commoditisation of transport and today's purchasing culture which can make it difficult to maintain long term relations with clients. And it has resulted in very low margins - Richard Burnett, CEO of the RHA, was quoted in Logistics Manager late last year as saying that an average SME operator makes around £60 profit per truck per week - haulage is a very low margin business! While Brexit feels like a disaster, could it in fact be an opportunity for the industry, breaking the deadlock on rates? If no deal goes ahead, things could get very nasty, but in every crisis there is opportunity ...only if you grasp it, though. Ian, my husband and business partner, was Group Distribution Manager for the country's largest catering butcher in the period spanning the Foot & Mouth crisis. Business associates would say: this must be a terrible time for your company. Not at all. Not one little bit. Fairfax Meadow were on the front foot, sourcing meat from alternative markets, and with the opportunity to take back control of rates, busting the log jam. Instead of unpredictable and unpaid "demurrage" of trucks, the logistics industry doesn't need to be a victim - it can benefit by helping the country through this hard time, but it does need to ensure that it fully understands its own cost structures and cashflow, and has the right agreements in place. Brexit could be that opportunity. For many a year the most boring graph in the world. There was a little bit of excitement in 2016 when the gradient looked to make a more dramatic change, before again settling into a slightly steeper slope. 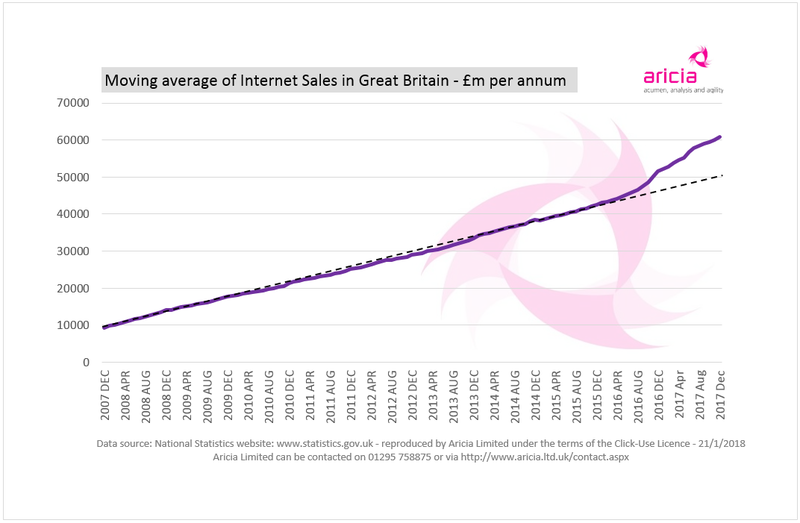 The graph shows the annual moving average of internet sales based on the latest figures released yesterday by the ONS (Office for National Statistics). As reported elsewhere, at 21.5%, the percent of all retail sales that online sales represented last month, was the greatest it's ever been. Black Friday was comparatively early this year, because of how Thanksgiving fell in the US - always the fourth Thursday with Black Friday the day after. But even before Black Friday was introduced to the UK, November was often the month with the largest proportion of retail sales occurring online. NB In 2016, Prologis published a report on ecommerce, with a rule of thumb for the US which translated to about 1m sqft per £1bn turnover, with ecommerce needing three times the distribution centre space required for traditional brick-and-mortar retailers. Using that rule of thumb, would mean that the UK now has c45m sqft of additional warehousing just to support the different format of shopping. A different type of Update! I originally posted this pair of maps as a Maptitude Tip (which was about how you can import logos to use instead of dots or other symbols), but a few people have been in touch about it, so I thought I'd post a more general update and capitalise on the interest! See below the maps for more description. Availability and price of appropriate property - so, for instance, if you started with the postcode districts delivered to by Amazon Fresh, you might conclude that somewhere like Park Lane could be a great place to be, but it's unlikely to be a possibility in the foreseeable future! Any comments or questions, please do get in touch! Why don't people want to be HGV drivers? There is a driver crisis, but we need to tackle it rather than exaggerate. We need to make the jobs attractive. There are over 940K people with HGV licences and up to date medicals, including over 100K people aged 25-45 with C+E licences who choose not to use them. There is a crisis, not a shortage. If you want to understand the graph fully, then read my four-pager here: Driver Crisis, and you can visit this page if interested in other articles etc on the Driver Shortage. 3 clerks – Edith, Fran and Gina (£12.08) – they are all brilliant at what they do – the business wouldn’t be where it is without them! Because I’m in charge of compliance, I got lumbered with filling in our Gender Pay Gap submission back in April. I don’t know what your impression is from reading the above, but I thought it was going to be embarrassing for our firm – the male pickers all get paid more than Anna; the male drivers get paid more than our ladies; no male clerks; no female managers; and then the top dogs paying themselves top dollar! I had to calculate everyone’s hourly rate regardless of wages versus salaries and then the various statistics to report. I’d heard people say that the measures the government had chosen weren’t great, but didn’t really believe how poor they were until I’d worked it all out. I can hear your brain whirring from here, wondering whether all of this matters. Well it does! Just because Badly Balanced illustrates that it’s possible for a badly balanced company’s stats to give a misleading picture, the fact remains that women in the EU still earn on average 16.2% less than men. EU Equal Pay Day is the day when the average woman stops getting paid compared to her average male colleague and works the rest of the year for free …with 16% of the working year remaining! Tomorrow, 3 November, is EU Equal Pay Day. Sounds good? It’s not! Do you live in the Amazon Fresh shadow? If there is a 4 minute additional delay as trucks clear Dover/Folkestone, the UK will have 5% less food. Not just 5% less food from the EU, but 5% less food in total – and that is probably an underestimate. No-deal Brexit will reduce the pipeline into the UK for food and other goods, not just on Day 1, not just in the first couple of weeks, but until we’ve established other sources. Obviously the impact could be much more significant. Quick to cut, slow to recruit? At first glance the data released by the ONS (Office for National Statistics) during the past month on the number of people employed in transport and storage doesn't seem to tell any fresh stories. What it has shown since the financial crisis is that there was a much bigger comparative drop in the number of people employed in our sector than for the economy overall, and not just on a one-off basis. 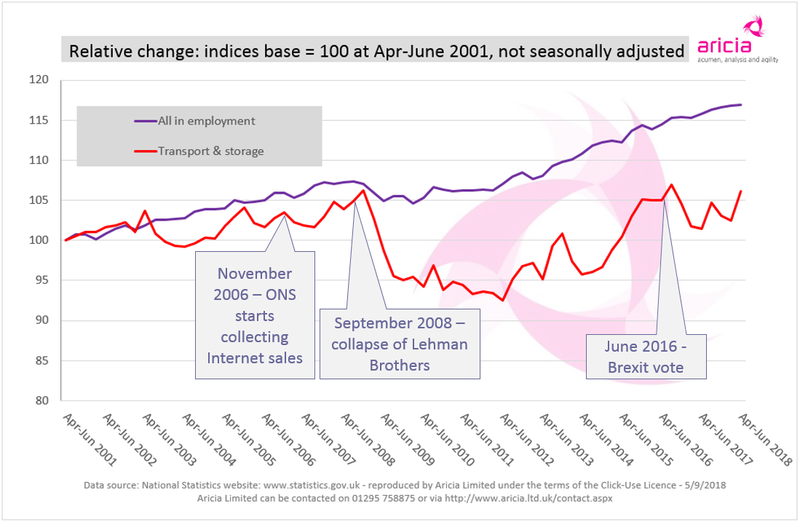 The purple line (all in employment) on the graph below only really does a bit of a plateau following the collapse of Lehman Brothers et al. Whereas the red line (transport & storage) shows a drop of more than 12%, despite the increasing work content of burgeoning ecommerce. It's worth noting at this point that transport and storage does include passenger transport as well as logistics-related employment. It appears that our efficient and flexible transport & logistics industry was better and/or more able (compelled by cost control or perhaps because of low commitment to agency staff) at reducing personnel in a way that was not typical of the economy as a whole. What also happened following the financial crash was that vacancies in transport and storage (not shown on graph, but in data released by the ONS at the same time) ran at a lower rate than for the economy in general. As a low margin industry we tend to use overtime as a first resort and hold off on recruitment until it becomes imperative. And the seasonal nature of our industry also means that we're loath to take on people for December who won't be needed come February. But, although we're back to a similar rate of vacancies per 100 employee jobs as the rest of the economy in this latest set of data, at peak last year we did move ahead and continue to have more than 40K vacancies (that's including warehouse staff and passenger transport), albeit still with a lower rate of vacancies than for a number of other sectors. Amazon - lots of logistics locations! 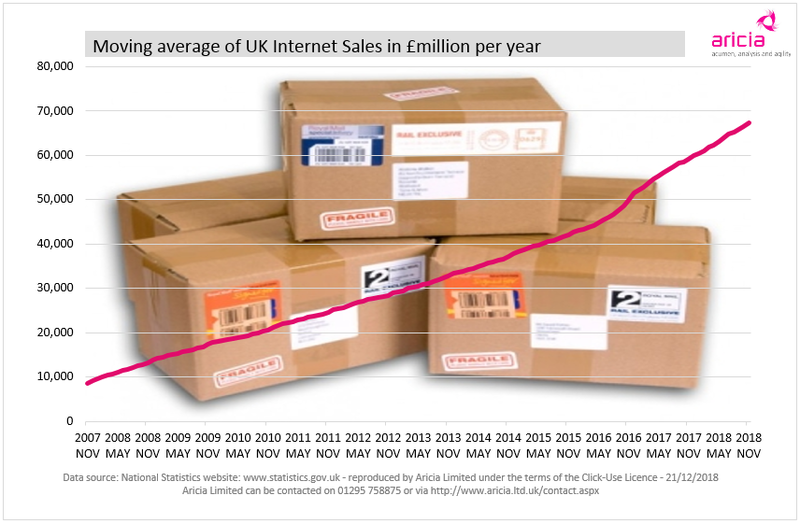 With the news earlier this month that Amazon UK Services, which operates the fulfilment centres in the UK, increased its turnover to coming on £2 billion last year, it seemed to be the right time to have another look at Amazon's footprint in the UK. Along with a lot of people, I'm really grateful for the wonderful work that MWPVL do each year in annotating known locations and pipeline around the world. My map below, created using Maptitude, shows both Fulfilment Centres and the various other logistics operations. Although many of the headlines report huge sqft, these can include multiple structural mezzanines that have been rentalised - I've tried to bring all the figures back to footprint, to make them more comparable with other operations. 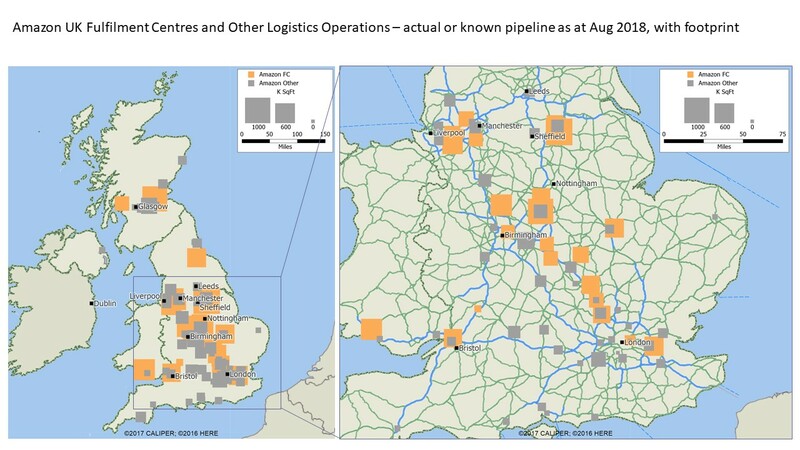 The map shows very good coverage of the UK - more than 92% of the UK's daytime population is within an hour of one sort of Amazon operation or another. The biggest news when the ONS SPPI* was published earlier today, was that it's a month sooner than it used to be, which means it's pretty much contemporary with the period being reported - has to be good news! Last time I produced an update on the SPPI I concentrated entirely on the road freight side of transport and storage, so this time I'm looking at the storage side. What is interesting on this graph is the different directions that the two handling price indices have taken in comparison with storage rates, although I do need to add a note of caution here ...in retail logistics and similar, we tend to think of storage as warehousing but, in the SPPI, storage also includes bulk storage such as for liquid and gas. What is interesting is the labour-related elements - while a ten percent increase over 5 years isn't really headline material, 9% over 2 years for cargo handling (the lilac line on this graph) has the makings of a news story and has clearly overtaken the all-services index. *The Service Producers Price Index is a bit like the CPI - it shows the increase in prices and rates paid, but for services provided by businesses to other businesses and government. 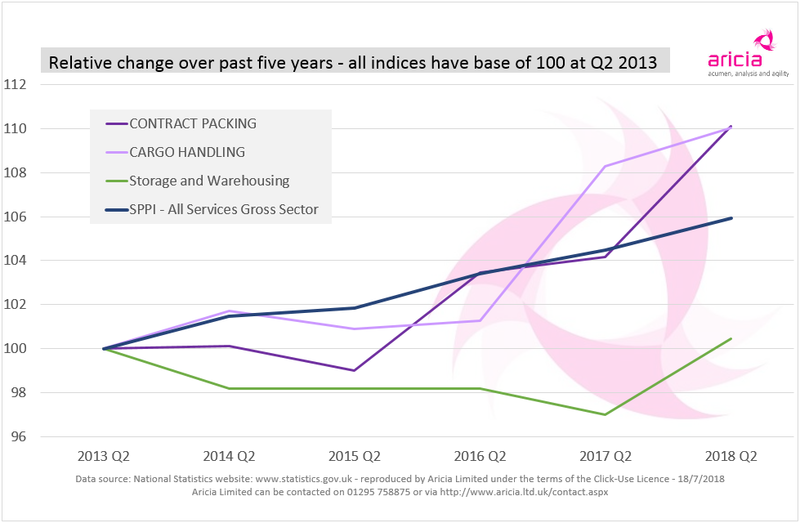 It provides a measure of inflation for the UK service sector with individual price indices, such as cargo handling, aggregated to create an all-services industry index. The SPPI is not seasonally adjusted, but I've displayed only the Q2 figures for each year (the most up-to-date figures for the SPPI which is a quarterly index) so they represent the same season year on year. 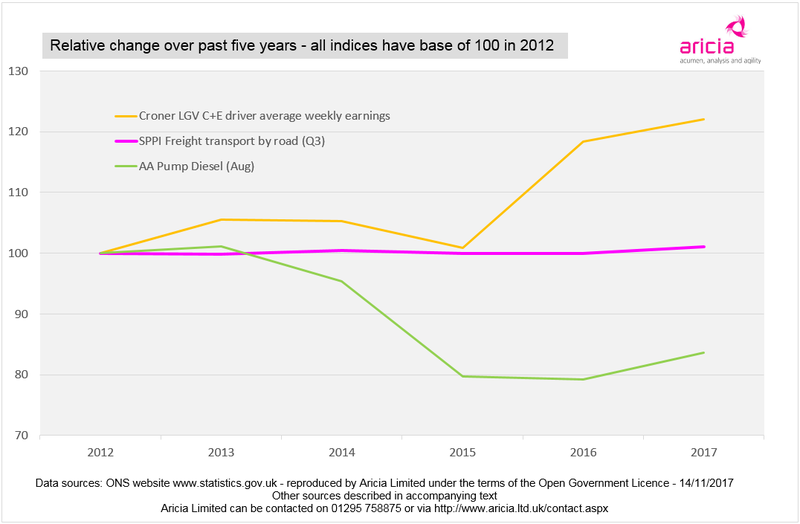 Having flat-lined for over 5 years, the ONS SPPI* index for Road Freight prices (the bright pink line on the graph below) finally broke that mould when published yesterday and has definitely started to climb ...but by less than 1.25% over the past year. In contrast, in Europe: "Transport prices in Europe in the first quarter were up 7.1 per cent on a year ago, latest figures from Transporeon reveal." reported Logistics Manager earlier this week. This, prior to the recent rises in diesel prices, with the CPI index for diesel going up by more than 1.25% from March to April. UK road freight is also out of step with some of the other indices in the SPPI. The index for All Services* (in dark blue on the graph), and the indices for Railfreight (grey), National Post/Parcelforce (green) and Courier Services (orange), while taking different routes, all end up in the same ballpark. UK road freight is in a completely different ballpark - surely rates must go up further sometime soon? *The Service Producers Price Index is a bit like the CPI, it shows the increase in prices and rates paid, but for services provided by businesses to other businesses and government - the top level Gross / GSO index as shown on the graph includes the provision of a number of different services to other service businesses as well as to non-service businesses and government departments. It is published by the ONS (Office for National Statistics) and is a quarterly index, so the most recent figures are for 2018 Q1. This index is not seasonally adjusted, but the reporting of Q1 for each year should remove most, if not all, seasonal impact. Earlier today the statistics for licensed vehicles in Great Britain at the end of each quarter were updated by DfT and DVLA. 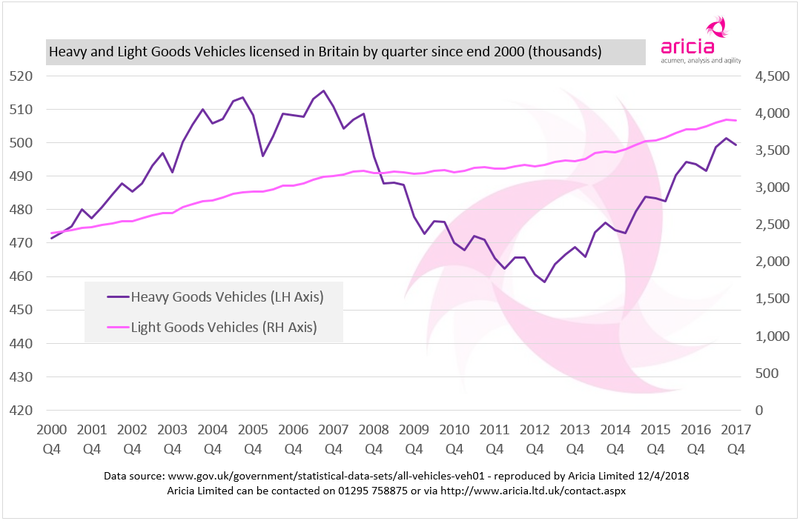 While HGVs continue to recover after the impact of the financial crash, it can be see that vans merely did a quick plateau before continuing their relentless rise. The seasonality of truck replacement can also be seen clearly, maximising the number of vehicles available at peak each year. Interestingly for vans, although there is little seasonality, what there is looks to be weather (and therefore construction) related rather than driven by ecommerce. The deadline has now passed and 10016 employers including more than 3000 companies with 250+ employees had submitted data by this morning. Of those, 406 were in transport and storage (SIC codes starting 49-53) including both logistics and passenger transport as well as storage and cargo handling for all modes. But whatever I report, the figures will continue to change – for instance, there were more than 70 organisations burning the midnight oil and making their submissions after 10 o'clock last night! The choice of measures the government selected for this exercise are not great - I'm reminded of the old joke, that if you wanted to go there, you wouldn't start from here. But we are where we are. Continued below the graph. Any pay gap figures I’ve used here refer to the difference in median hourly rates - the median is a better measure than mean for this, as it effectively removes the impact of a small group of low paid apprentices or a very highly paid CEO. The medians are established by putting all the women in one row in order of pay and picking the person in the middle, and similarly, but separately, for the men. A gender pay gap does not mean that women in the same role are being paid differently to men, it means that the median woman is being paid differently to the median man. If there are proportionately less senior women then the median woman is likely to be from a lower pay rate than the median man. The median pay gap in transport and storage is lower than general - 6.65% compared with 9.9% across other sectors, and it would be lower still if a few companies that have featured in various headlines were excluded. But this piece isn't about naming and shaming! The story that comes out for our sector is about lack of women generally (17.3% of employees compared with 49% across other sectors), and it's also about lack of women in senior positions - the proportion of women in our sector making it into higher paid brackets shows a bigger drop-off than average across other sectors. Now, on the logistics side, you might argue that the lack of women is due to the physicality of some of the tasks that need to be undertaken, and indeed manoeuvring loaded roll-cages is referred to by one of the companies in its submission. But the proportion of females employed is actually lower for passenger transport, and any physical aspects of the job certainly don't explain why women aren't getting promoted to the same degree. The submissions on what companies have found and what they intend to do will make interesting reading ...and next year will be the interesting one, as this year was a bit "bring out your dead"! This update was a piece of research carried out on behalf of the Women in Logistics CILT forum and reported on CILT's website. Earlier today the ONS (Office for National Statistics) released the latest inflation figures, including those for business to business services. As can be seen, in the graph below, the index for the SPPI as a whole (the dark blue line = All Services Gross Sector - see the footnote* under the graph) has climbed more or less steadily for most of the past five years, ending some 5% higher over that period. I've also included indices for three categories of general business expenditure which have somehow returned to the same sorts of prices as five years ago: Translation & Interpretation Services (dark red line), Recruitment & Personnel Services (lighter blue) and Computer Services (grey). The most interesting is translation and interpretation, with the index showing a marked drop in Q2 2017, the quarter after Article 50. I don't know whether that is coincidence! 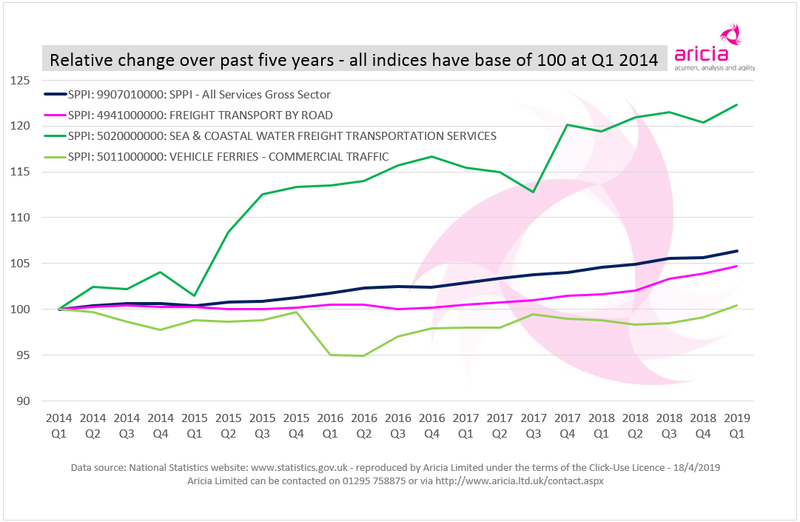 The index for Freight Transport by Road is shown as the bright pink line. With driver wages having risen after a period of stagnation (see update dated 14 November 2017 further down this page), the increase in the price of diesel could only mean one thing - road freight rates are finally on the up. After having been remarkably level for the previous four years, this index has risen steadily over the past 12 months and while that rise is low when compared with inflation generally, it has broken out of the previous recent territory it occupied. *The Service Producers Price Index is a bit like the CPI, it shows the increase in prices and rates paid, but for services provided by businesses to other businesses and government - the top level Gross / GSO index as shown on the graph includes the provision of a number of different services to other service businesses as well as to non-service businesses and government departments. It is a quarterly index, so the most recent figures are for 2017 Q4. This index is not seasonally adjusted. Warehouse productivity - what can I say? Earlier today the ONS (Office for National Statistics) released new figures and analysis related to UK productivity including output by industry. 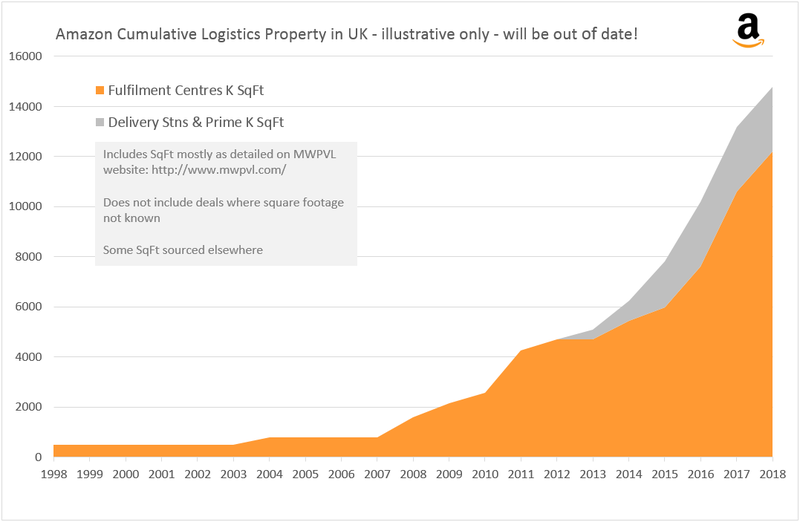 The graph below shows those for Warehousing, going back to the start of what is currently available. What the graph shows is the average weekly hours in millions (purple line) on the left hand axis and £ output per hour (red line) on the right hand axis. So not about warehouse productivity at a location level, and nothing about what people in the industry get paid, but about what they output at UK-level, and it's important to say that the figures go up to Q3 2017 and are experimental. They are also seasonally adjusted (so the impact of Christmas etc should be removed) and the output is at current prices. As you can see, there are areas of quite tight correlation, and then other areas where there is little (and even negative) correlation. Now, in the logistics industry, we all know that there have been changes in certain parts of our industry since the introduction of ecommerce with its singles picking and high level of returned goods to handle. And we also know that our industry is influenced by the economy as a whole. I've pulled out a few headlines in the boxes to show where these occurred. I'm intrigued by the changes in the past few quarters, but have no answer for you, other than to wonder if this is down to the heavy discounting that is happening so widely these days - reducing the value of the output, but leaving the work content the same. What I can tell you (and it won't come as a surprise) is that the sector with the highest £ per hour output is Real Estate Activities. This time last year, I published a similar graph, with the comment that the most boring graph in the world had suddenly had a little up-kick ...and that up-kick has continued. 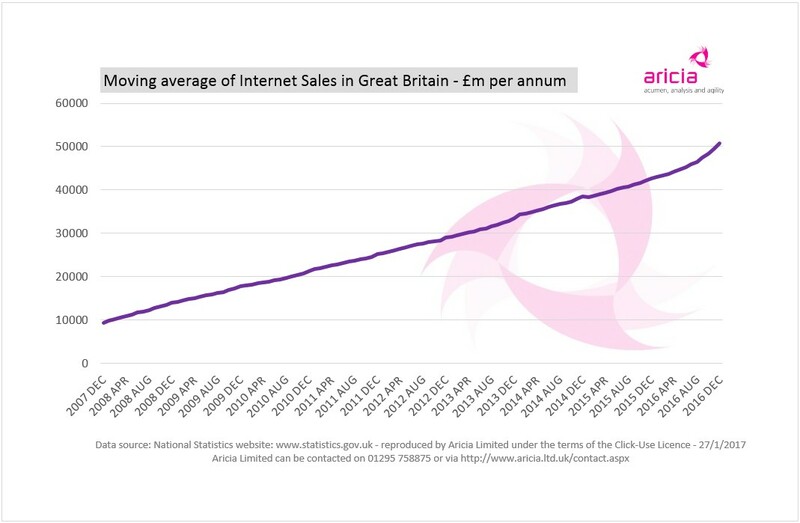 The purple line on the graph below shows the moving average of annual internet sales. The dotted 'trend' line is hand-drawn - from the start of the graph to the end of H1 2017 - the point at which the divergence from the earlier trend really started. The ONS (Office for National Statistics) commented in its bulletin that accompanied the release of the latest retail sales figures, at the end of last week, that the proportion of internet spending is continuing to rise, with almost one in every five pounds spent online by the end of 2017. And that physical stores (including high street and supermarkets) provided the largest positive contribution to overall growth of internet sales in December. However, the big question is profitability, with the need to accommodate Black Friday deals putting, for example, John Lewis under pressure, despite good sales. Earlier this week, IATA (the International Air Transport Association) published its latest annual statistics for both passenger and cargo. 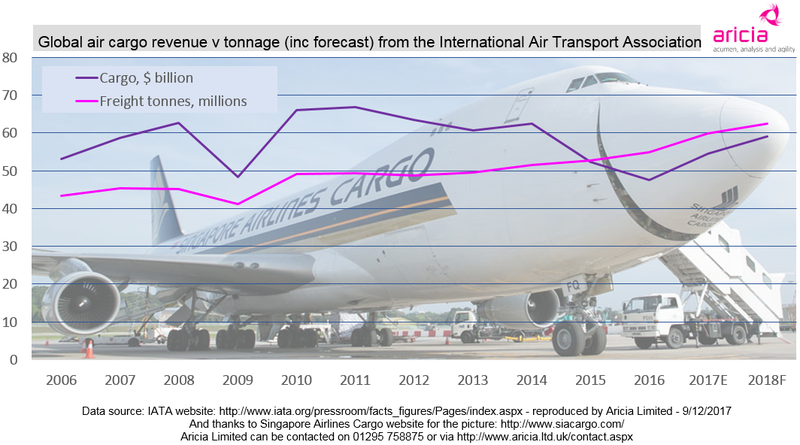 The graph below shows the revenue and volume for global airfreight for the period published - from 2006 through to an estimate for 2017 and a forecast for 2018. While not having returned to post-recession highs, airfreight revenues definitely look to be back on the up. There were two interesting pieces of commentary back in 2016 on some of the changes taking place in the industry. Although you don't see a reduction of tonnage at a global level, Seabury Consulting (see slide 24) commented on the way that lighter weight mobile phones have overtaken laptops, leading to overall lower tonnages shipped, and the Loadstar addressed the issue of falling revenues saying that "slowing production, overcapacity, and a lack of ‘hot’ consumer must-haves" was causing air freight rates to sink to some of the lowest levels seen in years. IATA comments on the upturn in 2017 saying that "the boost to cargo volumes in 2017 was a result of companies needing to restock inventories quickly to meet unexpectedly strong demand", and while it doesn't expect the rate of increase to remain the same, it does expect growth to continue into 2018. Thanks to Singapore Airlines Cargo website for the cheeky airplane pic! 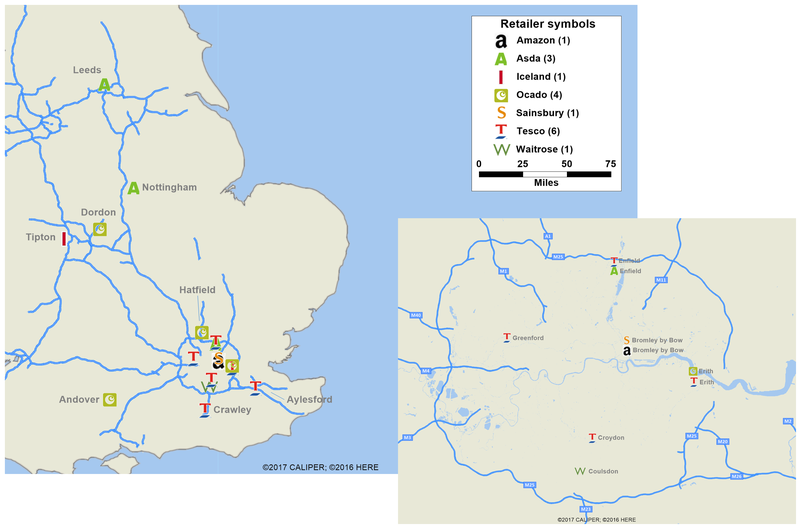 Black Friday seems like an appropriate time to publish this update, on the logistics property that Amazon has accumulated in Britain over the years - often quietly, sometimes not - particularly more recently. I've made my best efforts with this graph, but I know it will contain errors where it's not quite clear how big a property is (do you count square footage for different floors for an exercise like this? I've tried not to). And it will already be out of date - partly because the Amazon world moves so fast and partly because there are some locations for which I've just not been able to find the square footage. If the graph looks like it's showing a slowdown, don't be fooled - 2018 hasn't happened yet and internet shopping just carries on and up! 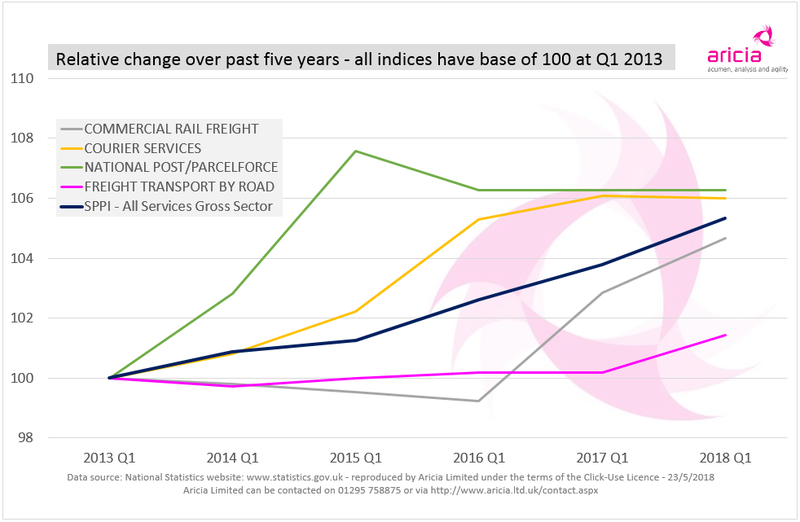 I thought I'd do an update on the SPPI* quarterly figures, fresh out today from ONS (Office for National Statistics), and started with the index for Freight Transport by Road (pink line on graph below) ...totally boring - up a bit compared with last year, so not quite flat-lining, but hardly news. As per my road transport rates update at this time last year I decided to look at the key components - fuel, driver wages and price of trucks ...although of course this last element will probably have to be revised backwards when the various cartel court cases have concluded, so I've left it out in the graph! In doing this I found that the FTA is no longer publishing bulk fuel prices on its website (boohoo - this has been a trusted free source of benchmarking info for many a year), although I've since had a very good conversation with Portland Analytics about the pay-for services that they offer in this area. 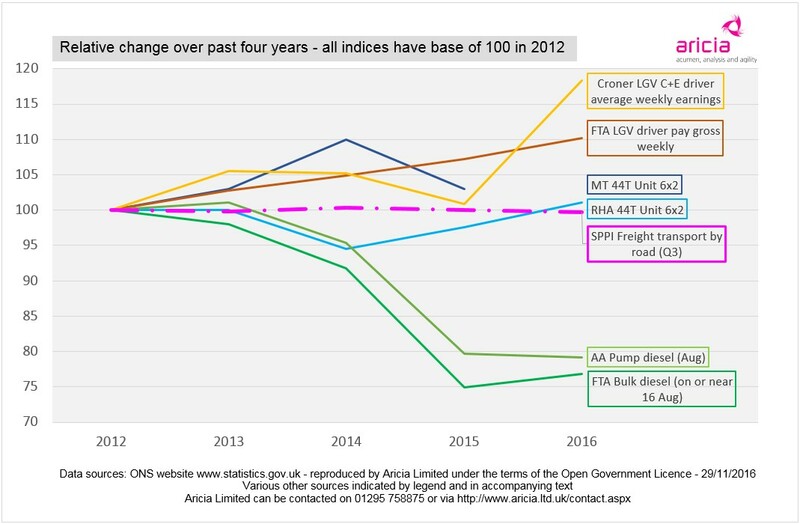 For today, I've just used the AA Pump Prices (green line), which are what they say on the tin, pump prices, but converted into an index show the right sort of increase / decrease year by year. I also found an interesting report while on the FTA's website, which I managed to miss at the time - back in July, the FTA published its latest Skills Shortage Report, which contains various key indicators including (reading between the lines) that there's been an increase of more than 25K UK-born people working as LGV drivers between Q4 2015 and Q4 2016 (and a similar increase in UK-born van drivers). The FTA's own figures suggest that the rates being paid may have dropped back again, but looking at the figures from Croner Distribution & Transport Rewards survey (orange line), one can't help wondering if that thing called 'market elasticity' isn't at work ...paying more, and in turn making driving more attractive as a job! *The Service Producers Price Index is a bit like the CPI - it shows the increase in prices and rates paid, but for services provided by businesses to other businesses and government. It provides a measure of inflation for the UK service sector with individual price indices, such as Freight transport by road, aggregated to create a service industry index. The SPPI is not seasonally adjusted, but I've displayed only the Q3 figures for each year (the most up-to-date figures for the SPPI which is a quarterly index) so they represent the same season year on year. If you found this piece interesting, you may be interested in our page on the driver crisis. Last week the BBC carried the news that UK unemployment has fallen to a 42-year low, and I imagine that there are people in the logistics industry thinking that the driver crisis will get worse. During August, two stats that are of interest to the road transport industry have been released by the ONS: the SPPI index for freight transport by road and the number of people working as LGV drivers. 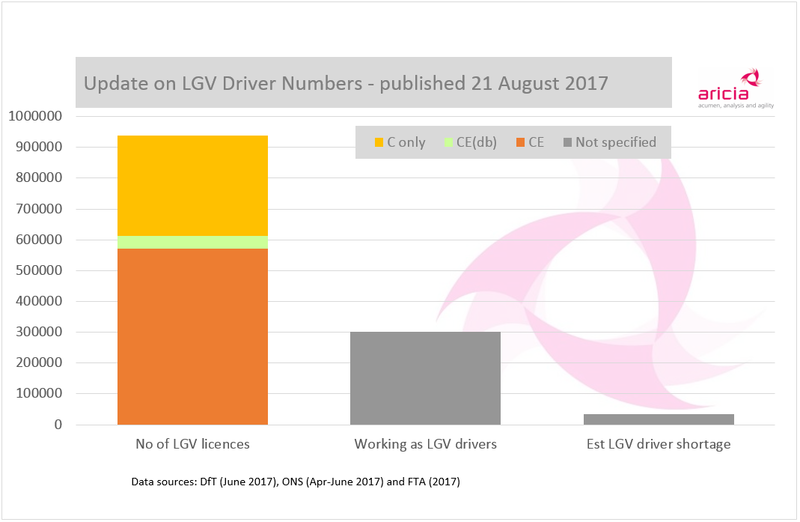 Earlier this summer, and for the first time in over a year, the figures for the number of people with LGV licences was released by DVLA. And also, during the spring, the FTA's Logistics Report 2017. The graph below shows the various driver related-figures - the number of C&CE licences (on the left hand side) is for GB only, the number of people working as large goods vehicle drivers (the middle block) is for the UK including Northern Ireland. The relative size of the 'shortage' can clearly be seen - the tiny block on the right hand side of the graph. The number of licences held is for people with medicals, but not necessarily DQCs ...so it would take just a week's training, with no test, for that not to be an issue if someone wanted to get work in our industry. It looks as if CE(db) is drivers with a 102 code - ie restricted to drawbars, although I'd like to see that in writing. It doesn't include more than a quarter million provisional LGV licences. What the SPPI index for freight transport by road shows (not on the graph) is that haulage rates have risen by less than 1% over the whole of the past five years. Brexit is coming and the driver crisis is not about to solve itself - something has to change. I've only just made time to read the 'Feeding London 2030' report commissioned by UKWA some while back - I was interested as soon as I was aware of it, and with emails currently coming in from various industry sources about clean air zones and banning diesel vans, now seemed like the right time. I've been involved in more than one project around the difficulties of delivering in the capital, including for a foodservice company looking to establish an operation to serve London - this project had a particular focus on the legal restrictions: congestion charging and U/LEZ zones, weight limits including on and adjacent to London bridges, red routes, the so-called 'night lorry ban', the safer lorry scheme, multiple local un/loading restrictions (and the risk of PCNs), and the City of London Corporation 7.5T MGW limit in its central area, unless you need access to un/load. Oh, and then things like the wonderfully toll-free Woolwich ferry, the key link for the North and South circulars, not operating at night - not a legal issue, but pretty important. To continue reading, please click on the picture below. They might be operating in the same sort of sector, but you can immediately see that the stories told by the traces on this graph are all different ones - home delivery of fashion is by no means a straightforward offer if you're the customer. So what's going on? 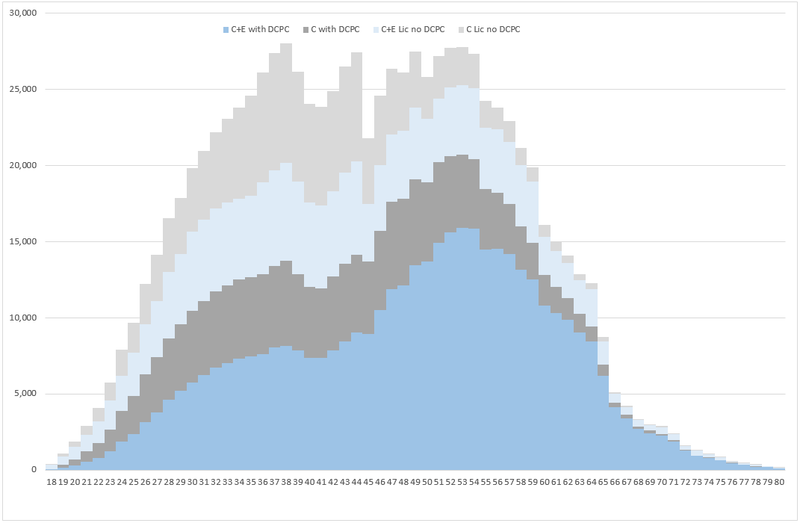 Starting at the top of the legend and the bottom of the graph, with ASOS (blue) - the charge has remained the lowest at the three dates sampled in 2009, 2014 and 2017, and the last order cut-off has pushed out later and later until now it's midnight. Harvey Nichols (red) is two spots rather than a trace as it wasn't offering a next day service in 2014 (what would have been the mid-point if it had been a line), and currently has one of the earliest cut-offs and the highest charge, but I guess if you shop there you can afford it. House of Fraser (green) offers a later cut-off and a lower price than it used to do. Jigsaw (purple) has retreated from its 2014 order cut-off, but stuck with the same price point over the years. And finally John Lewis Partnership (orange) has pushed the order cut-off back to 8pm and slightly increased its charge. I guess at the end of the day it's what works for a combination of the place that you occupy in the market, the sophistication of your systems, the service that your volume commands, the extent to which you regard home shopping as integral to your customer offer, the extent to which you're trying to cover your costs ...and a multitude of other factors. But there's no trend or stereotype - intuitive it isn't. £50BN & A Cheeky Little Up-kick! When the retail sales figures for the crucial December trading period were published by the ONS (Office for National Statistics) last week, there seemed to be quite a lot of confusion and criticism. The ONS go to a great deal of effort to make sure that their figures are representative, and retail sales data is collected from approx 5K retailers, including all of the large ones and a representative sample of smaller ones. While this includes only 2.5% of businesses in the industry, it is estimated to cover c93% of known turnover. So you could say, well, if there's a problem then it's down to GIGO - garbage in, garbage out. But it seems as if that's not the case and that it's more about what assumptions are made about the results presented, with Verdict jumping in with an explanation. 2) The most boring graph in the world (see below) suddenly stopped its inexorable rise ...to accelerate into a cheeky little up-kick! Hiding Our Heads in the Sand? Earlier today the ONS (Office for National Statistics) published the latest inflation figures. All the headlines are about the CPI. the Consumer Price Index. It's understandable in part - that's what affects how far the pound in the pocket goes, and it's what the Bank of England is targeted to influence. But the real news is the PPI, the Producer Price Index*, and in particular what's happened to input prices over the past year. Inflation in factory gate prices was 2.7% for the year to December 2016, so ahead of the CPI at 1.6%, but not particularly scary. But the overall inflation on prices for materials and fuels paid by UK manufacturers for processing (input prices) was 15.8% for the year, largely as a result of exchange rates and the price of crude. 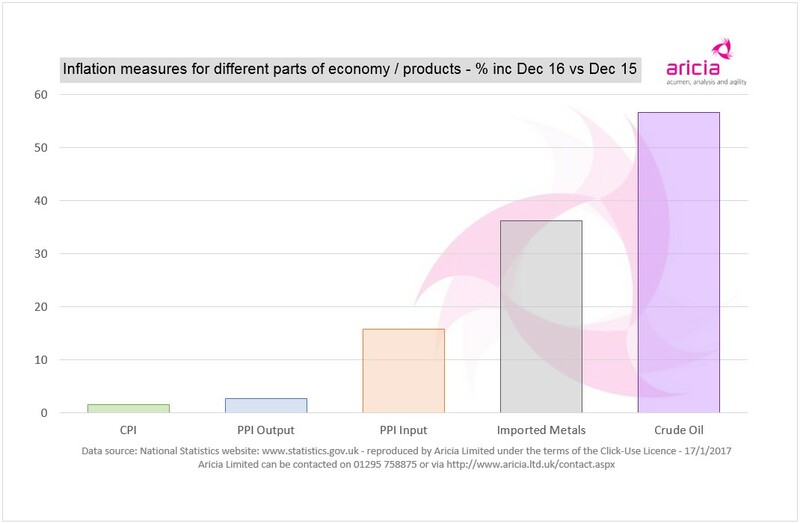 The graph below shows that the headlines should be about the constituent parts of PPI input - imported metals up 36.2% and crude oil 56.7%. So, as a nation, are we hiding our heads in the sand by ignoring these input figures? Actually, turns out sand would be a good place to be, with only circa 1% inflation in those sorts of supplies over the past year. I can well believe that, having gone shopping at Banbury Gateway Retail Park on Saturday 17 December - to say that it was dead was to put it mildly - I've put together a document with some photos I took. The pictures aren't great for a couple of reasons - photography is not a core skill of mine and I was only taking the pics to show my husband how empty it was. As time went on, I did get into my theme, so I fully admit that I waited for a shopper to get out of the way for one or two of the later shots ...but partly so they didn't think I was snapping them as individuals! Here are my pics. What were your Christmas shopping experiences like? 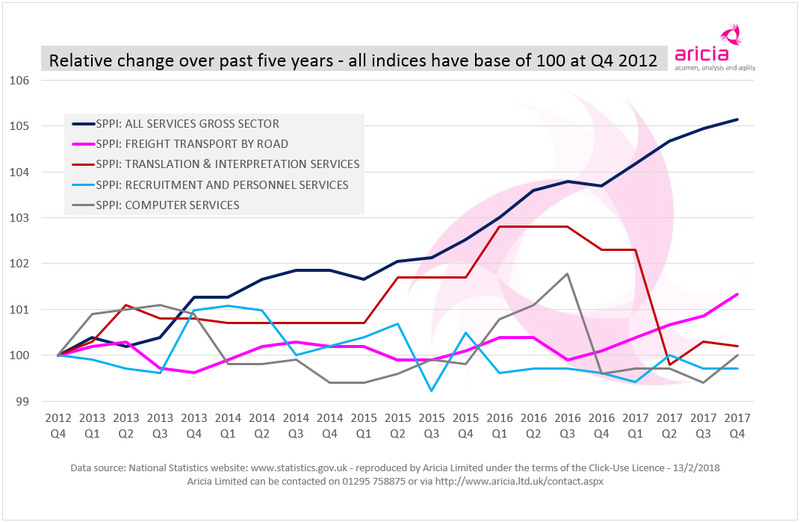 Last week the ONS (Office for National Statistics) published the latest SPPI* figures, and I was struck by how little movement there has been in the road freight element of the index over the past few years. You can see this (the bright pink broken line) in the graph below and also some major constituent costs of road transport. The SPPI is not seasonally adjusted, but I've displayed only the Q3 figures for each year (the most up-to-date figures for the SPPI which is a quarterly index) so they represent the same season year on year. In terms of the major constituent costs, I've included driver wages (two sources** in shades of yellow/brown); the purchase cost of an artic unit (another two sources** in shades of blue); and diesel (two alternative sources** in shades of green). All of the costs have been brought back to an index of 100 for 2012 so that the relative movement can easily be seen. While wages have increased over the past four years and the cost of the tractor element of the truck has ended up at about the same as 2012 (although with alternative sources indicating different price movements during that period), diesel has dropped dramatically to less than 80% of the price it was in 2012. It's interesting that the result of all these ups and downs is what your local hospital would call "flatlining"! How does this compare with your experience? *The Service Producers Price Index is a bit like the CPI - it shows the increase in prices and rates paid, but for services provided by businesses to other businesses and government. It provides a measure of inflation for the UK service sector with individual price indices, such as Freight transport by road, aggregated to create a service industry index. It does not aim to provide full coverage of the "service sector" - the primary use of the SPPI is as a deflator in the UK National Accounts. 8 Out of 10 Employees.. 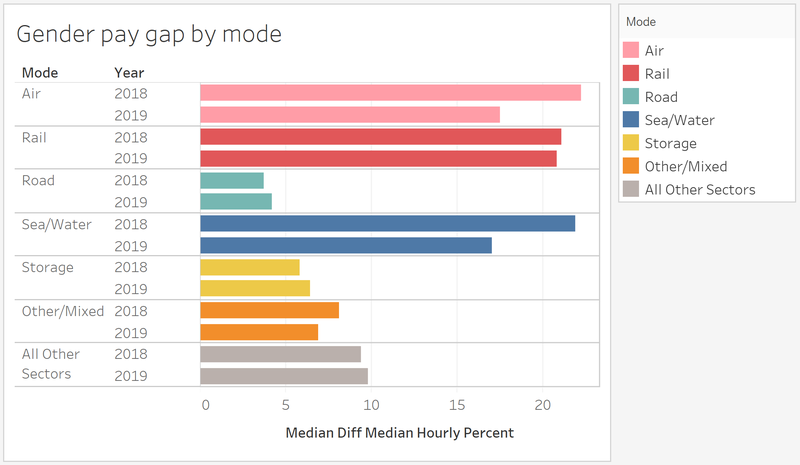 Following my previous post, someone asked me about how pay relates to hours worked, so I've combined two of the many data sets from the Office for National Statistics' Annual Survey of Hours & Earnings in the diagram below. What are the boxes in the diagram all about? It's my attempt to show the span of hours and span of pay for most people working in the UK as a whole and for some specific occupations. Unlike the previous update, I've used the figures for all employees (not just full-time). See below the diagram for a description of how to read the it. On the x-axis is paid hours worked per week - the span of each box goes from the figure for the 10th percentile through to the 90th - you can see the previous update for a description of percentiles, but if we look at the red box for the UK as a whole, it means that 80% of employees work somewhere in that span of hours (so it excludes the extremes at each end). And the y-axis shows gross weekly pay, and again the span runs from the 10th to 90th percentiles, so that 80% of employees get paid somewhere in that span. It's important to note that it will be a different 80% for the x and y elements of each box, but there will be a broad overlap. Also, note that for ease of representation, the boxes go to the nearest 2.5hrs and the nearest £50. And it'simportant to consider that this is for "paid hours per week" - it is quite likely that, for instance, managers and directors may well be working more hours than they are technically paid for. NB ASHE covers employee jobs in the United Kingdom - it does not cover the self-employed, nor does it cover employees not paid during the reference period.